Absolutely stunning 6 bedroom with a 20×20 game/media room and fabulous lake/golf views of the Squire. This 2-story CBS home has 3 bedrooms, including the master suite on the 1st floor and 3 bedrooms + family room/kitchenette/laundry upstairs. Well designed with extra insulation in walls/2nd story flooring for the maximum in quietness, and separate side-entry driveway, 3-car garage. Beautiful foyer entry with hardwood floors on the diagonal. Crown and wall moldings. Formal dining room and living room with marble fireplace. The kitchen is a gourmet’s delight with double appliances and an enormous granite island. The master suite is lovely, with a large upscale bathroom and terrific walk-in closet. 2 VIP suites with built-ins are also on the ground floor. Fun abounds with a huge game room and large backyard with incredible rock waterfall slide/pool/spa and loggia. 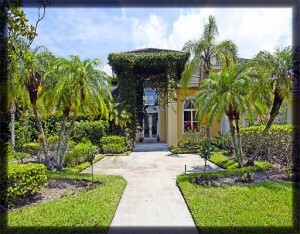 Posted in golf community, Homes For Sale, palm beach gardens homes on August 6, 2010 at 6:00 am.